Update: The coupons have reset so you can print them again! 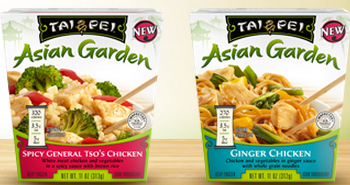 Walmart has Tai Pei Asian Garden Entrees for around $2.49. 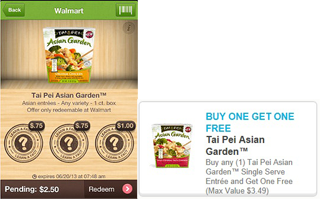 There is a BOGO FREE Tai Pei Asian Garden Single Serve Entree Coupon(Use Zip 84042) plus you can get $2.50 from the Ibotta App which would make 2 of these FREE(see deal idea below)! That’s 2 FREE after coupon and cash back! Hi Joellen, To change your zip code go to the top of the page on Coupons.com and click “LOCAL” then put in zip code 60050 and click “APPLY” once you do that go back to “COUPONS” and then go under the “FOODS” category and you will find the coupon. I hope this helps. thats what i thought.. i keep trying that and it keeps resetting the older zipcode. when i go back to local after trying its always the older zipcode there. it does not seem to be working for me. Joellen, When you put the zip code in just be sure that you don’t leave any spaces before or after the code otherwise it will default back to your zip code. Sorry, had to refresh the page and I saw your reply to the other question!! That solves my problem, thanks! Thanks I printed 2 coupons.